Wrap all and each of these your people in your love. In Los Angeles and Detroit, Minneapolis and Miami, in Denver and in 138 other cities, towns and villages across our nation. The bombs are exploding again in Gaza and Israel. Violence continues hidden in so many homes and families around the world – and the abuse of innocent children…. Your peoples lift their hands to you. We pray for stillness, for justice, and for peace to come and to last. We fear that they will not. God of Abraham and Sarah, from which three great religions stemmed. We pray for peaceful existence between Israelis and Palestinians, Sunnis and Shiites, Muslims, Jews and Christians. We pray negotiations which can reach the roots of historical conflicts. We pray for a commitment to human rights by all sides and the protection of all lives. 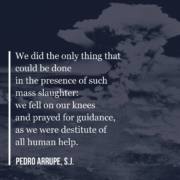 We pray for effective international intervention to ensure justice for all sides. We pray for humanitarian aid and rebuilding where destruction has occurred. We pray for peace and for justice in our homes and on our city streets. We pray for an end to violence, war and death. Grant us this, peaceful God. Grant us a peaceful world. July 20, 2014 /6 Comments/by James Hug, S.J. What is more practical, as a faith-filled, justice-oriented parent, than to teach my child to pray? We all need to pray to stop this violence around the world,an learn to love one another. amen. truly its peace in our world that we need.